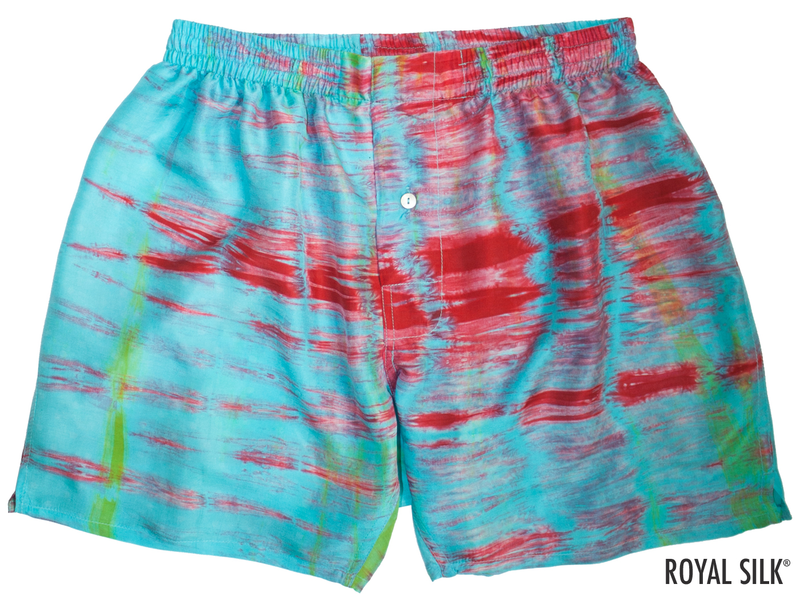 Eye-pleasing tie and dye silk boxers by Royal Silk® in a lively design of mostly blue-green turquoise colors with splashes of fire red crimson. Designed to tease and please. Styled in India Silk, a silk so wonderfully light and soft that it will feel like a second skin with an amazing touch. Try this pair of silk boxers and you will know how comfort can feel so sublime and why only silk is silk. Because this tie and dye design is hand-made, no two pairs are exactly the same. 100% Silk. Imported. Hand wash or dry clean, easy instructions are included. To machine wash, we recommend our fine mesh Washer Bag for silks that is sold separately in two sizes. For waist sizes S (30-32"), M (33-34"), L (35-36"), XL (37-38"), 2XL (39-40"), and 3XL (41-42”). $39.